PHOENIX – From a farm or a maquila in Sonora, Mexico to a supermarket store in Chicago, the journey of products coming from Mexico is a long, sometimes slow one. 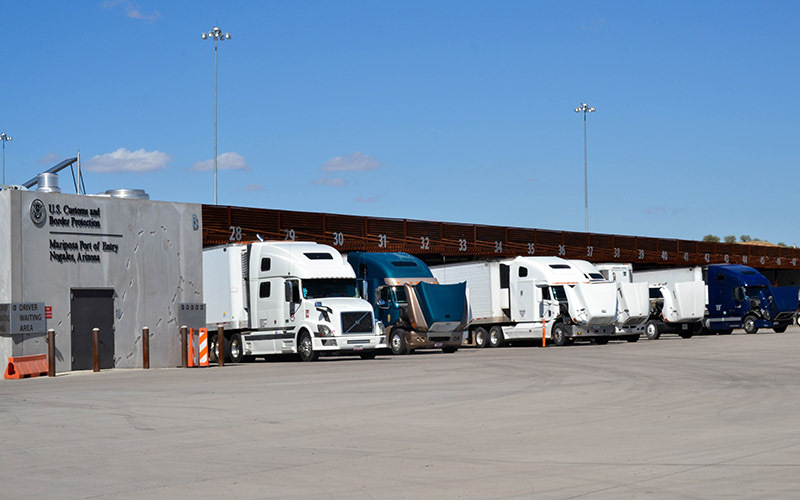 But according to border experts and officials, it’s during customs inspections at the border where the process gets delayed the most because ports of entry are understaffed and their need for investment is often overlooked. According to a 2016 Customs and Border Protection report to Congress, CBP has 2,107 unfilled officer’s positions, despite an increase of more than 30 percent of trucks with goods crossing from Mexico over the last decade, according to date from the Bureau of Transportation Statistics. In Arizona, the Tucson sector has over 20 percent of unfilled positions, according to a letter the Arizona Border Counties Coalition sent to the state’s Congressional Delegation in August. “(Ports of entry) have been significantly neglected by both the U.S. and Mexican federal governments. This is one of those things that’s almost too big to see,” said Erik Lee, executive director of the North American Research Partnership, which is based in Arizona. The lack of staff and investment in technology and modernization of the ports of entry has led to longer waiting times during crossings, which ultimately hurts businesses and tourism, according to Lee and the Fresh and Produce Association of the Americas. “You get a depressed shopping environment in local border communities, and on the commercial side, you have these long border wait times (that) potentially hurt transportation, manufacturing and agricultural companies,” Lee said. According to Lance Jungmeyer, president of the Nogales-based Fresh Produce Association of the Americas, ports of entry are in need of more agricultural inspectors, but they are usually not the priority for hiring and investment efforts. According to CBP’s report, there is a need for 631 agriculture specialists nationally. Jungmeyer said certain fruits and vegetables, particularly the ones that have many leafs or places where bugs can hide inside, require a lot of time of inspection. “What happens is, the trucks that need to be inspected, just stack up and they’re waiting there longer,” Jungmeyer said. The longer the wait, the less fresh the produce is, particularly during the summer, according to Jungmeyer. “When we’re not able to get the produce across in order to match up with the customer expectations, that’s a problem that certainly disadvantages us,” he said. During peak season, which is from February to April, there are approximately 1,800 trucks crossing through Nogales a day, Jungmeyer said. Customs and Border Protection in Tucson did not respond to several requests for comment about the staffing and investment needs at their ports of entry. But lack of investment is not the only challenge the Arizona ports of entry face. Experts say it’s difficult to hire for CBP officer positions because the border is not very attractive to potential workers, and the process of getting hired takes about a year. “A lot of these folks are married and their spouses want to work, and they have a very difficult time finding jobs in these small communities,” Lee said. “They’re trying to work on a marketing plan to kind of sell the state better and say ‘there’s actually all these things happening,’” Bravo said. But Lee thinks there are not so expensive solutions that can be put in place without the need for large investments. According to Lee, improving “trusted traveler and shipper programs,” which pre-approve eligible “low-risk” travelers through background checks, could help mitigate some of the logistics problems. Still, both Lee and Jungmeyer believe there is a need for congress to know more about the importance of the role that ports of entry play in border security, shifting from the almost exclusive focus they give to border patrol. “Kind of a feel of the border in the national capital is that it is not altogether positive,” Lee said.